Oddly enough, even my strange sense of humour can be a little stretched, when I have a senior police officer sitting in my home, his notebook open, his pen poised at the ready to interview me under caution; all over what I can only regard as an outrageous complaint by a member of the public. Not everyone will be familiar with Tom Wolfe’s famous political novel or the movie, ‘Bonfire of the Vanities’ but a recent short story of politics, planning and policing, here in Thanet, has an uncomfortable resonance. Imagine for a moment, that you are the happy owner of a well known Margate boutique B+B. A relative newcomer to the area but already energetically and vocally active on the political scene. Perhaps having recently failed to be elected as an independent councillor, you are drawn to indulge in some brief episode of melodrama. This might even stretch to believing you have become the focus of harassment and abuse by a sinister cabal of local Conservative councillors? Imaginary friend or not, if you should choose to place yourself in the public gaze, online, here in Thanet, it can be a bruising and frequently unpleasant experience. Here, I'm thinking of a lady who may wish to restrict or even refuse comment on her part in this long-running planning battle ; on her own weblog ,She appears equally reluctant to accept criticism elsewhere and with it, the attention of the handful of trolls, who frequent our gossip-ridden and frequently abusive local weblogs. In June of 2013, such comment apparently became too much. On ThanetLife and focused on an entry; ‘A Necessary Decision.’ Sir Roger Gale MP delivered his view on on the Secretary of State`s determination to grant consent, with conditions, for the Arlington (Margate)Tesco project. This was a rejection of the planning appeal that the lady had worked so hard to support and in the story’s comments, anonymous readers question her motives. They remark on the cost to the Thanet taxpayer and one reader suggests, rather unkindly, that she’s an outsider, recently arrived from the north of England, hell-bent on reforming local politics and regeneration efforts to suit her personal agenda. But what happens next is remarkable as both a test of the law and in regard to what many readers might believe to be their right to exercise free speech on a matter of public interest. Our B+B owner complains to the police, reportedly claiming a conspiracy of sorts against her exists, involving harassment by three local councillors. In particular the police officer, directs my attention to the comments on the ‘Necessary Decision’ story, as the evidence of her complaint. Not Quite What's on the Plans! 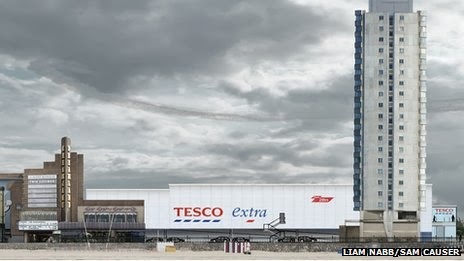 The Facebook page of former Mayor of Margate, Mick Tomlinson, is produced by the police officer, where she is chided for exaggerating the size and position of the proposed Tesco. The police are then pointed to another councillor, ‘Liking’ that same comment on Facebook as further evidence of a clandestine political conspiracy. You might be forgiven for wondering, if overnight, Thanet had been revealed as a forgotten corner of North Korea with a simple 'ticked' opinion perceived as a criminal offense? Now, ‘Conspiracy to harass’ as described by the police, is a serious criminal offence, particularly so if you happen to be a political figure, work in local government or are employed in a professional or responsible role. When the police see this for the first time, they take a quick look at the evidence on offer and do absolutely what you might expect of them; absolutely nothing. Perhaps she believes this reluctance to take action is simply evidence of another conspiracy or perhaps simple incompetence on the part of the police for not seeing the truth of it all? For the complainant, it’s not good enough. So the lady reportedly lobby’s our new Police Commissioner, Ann Barnes. After all, Thanet Councillors have, in the past, earned an unhappy reputation in ‘Private Eye’ magazine, for one thing and another and this complaint is the icing on the cake. Ann Barnes, then reportedly refers the complaint to her Chief Constable and in response, he appoints two senior inspectors to review the file and re-open the complaint, reporting back to the Crown Prosecution Service on whether a prosecution should follow. So the first I hear of this complaint, is an email from the police requesting an interview on a matter of sensitivity. Always happy to cooperate with our hard-working and under-resourced law-enforcement, I invited the inspector to my home, where to my surprise; he announces that he would like to interview me ‘Under Caution.’ With nothing to hide, I waived my right to have a solicitor present and wait to see where this is all going. The next ninety-minutes of my afternoon, are taken-up with questioning and examining my weblog in the light of the printed evidence the police officer has bought with him. Apparently, it’s alleged that together with two other council colleagues, I have somehow conspired to harass the worthy lady owner of a Margate B+B, by making untrue and defamatory comments damaging to her reputation and business. You can of course read all of these comments on Thanet Life. But there’s one small problem. I haven’t made any comments. In fact, I had rather foolishly believed I was on good terms with the lady; pointing the police officer to the exchanges on my Twitter feed. More the fool me. There exists a world of difference between an opinion and a conspiracy and there are, as I pointed-out to the inspector, comments left by other people on www.Thanetlife.com. Some are anonymous, some are not. Yes, I do moderate my weblog and have an acceptable use policy but while some of the remarks are undoubtedly robust, frequently badly-expressed and occasionally unkind about her origin in the north of England, they do, I believe mostly represent fair comment on a story of real local public interest are no different, I suspect to what you might find under stories in the Daily Mail Online. If the good lady in question had any issue or concerns, there is protection for those running websites if they can show they are not the authors of defamatory posts and assist in identifying those who are. I pointed-out to the police officer, a simple call or email would have had me remedy the situation. Apparently then, the same overworked police inspector has been making the rounds of Thanet’s bloggers and trolls, interviewing them and attempting to determine whether they are part of some wider conspiracy to harass Margate’s self-appointed public champion and B+B entrepreneur; reportedly, involving Google and tracking one elusive ‘blogger’ all the way across the Wantsum Channel to the state of Arizona, which, I have discovered, lies beyond Whitstable. During the ninety-minute inquisition, the inspector warned me that a Standards Complaint was also winging its way from the same source to solicitor, Harvey Patterson at Thanet Council and this proved correct, when a few days later, I received notice, ref TDSSC112/13 that it is alleged by a member of the public that I have “Made unacceptable comments” about a member of the public on my weblog, which of course I haven’t and this account will be delivered to the council's Standards Committee in my own defence. So, in addition to the costs involved in challenging the building of a Tesco on Margate’s seafront, we now have considerable police, personal and council time taken with pursuing a serious complaint against three of Thanet’s councillors and I will soon be submitting an FOI request to determine the costs of this frivolous if not malicious exercise. Furthermore, the judgement of the Police Commissioner is once again under scrutiny. If the police rejected this vexatious complaint once, why did Ann Barnes, as I was told by the police, intervene to resurrect it? I don’t know but I’m sure that many people, local politicians of all parties included, would dearly like to know the answer. Finally, many of us may accept accept that Thanet has always been insular by nature and people don’t always take kindly to newcomers on personal crusades. That said, Cllr Ian Driver appears to be successfully breaking new ground, busily driving his own militant soap-box around Ramsgate and hoping the wheels don't fall off before the next local elections. One might however remark, that by involving the police, this particular Yorkshire lass appears to be piling-up her own bonfire of the vanities. This may yet become the funeral pyre of her reputation in Margate’s politically-active community, if she’s not prepared to accept criticism from anyone, anywhere and at anytime. The police have today, now referred this to their legal services department for direction as they are unable to reach a decision on the matter and for now, at least I have to turn-off comments here. I do wonder what the Wifi signal is like in the prisoners accommodation on the Isle of Sheppey as I wait for the police to decide, in the 'newspeak' of George Orwell's 1984 whether that innocent act of ticking 'Like' on a Facebook page, constitutes for one of my colleagues, a serious criminal offence in the Britain of 2014.